Rowing combines technical expertise with fitness and crew spirit to produce the ultimate outdoor team sport. It is fun – you will find yourself smiling and laughing a lot, and will be satisfied and proud with your achievements and improvement. 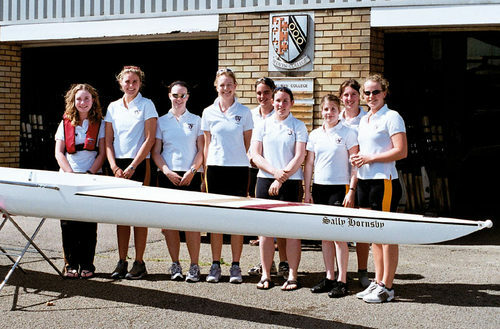 Rowing is a terrific way to meet other people from all years and all colleges, and in particular your fellow freshers, many of whom you would never even get to meet otherwise. The people who you row with, learn to row with, race with, win with, lose with (not much of this though) will most certainly become some of your best friends for your university years. From the infamous formal swaps with other Colleges to BBQs and fabulous end of term dinners. You’ll never be short of opportunities to drink, eat and be merry! Click here for a list of social activities at SCBC. Rowing is an excellent sport to take up if you would like to try something new, and this is the best – perhaps the only – opportunity you will have in your life to have a go. Rowing can add both structure and a breath of fresh air to your day whether you’re a science or arts student.Get a chance to simply switch off from academic stress. A disproportionate number of Boat Club members hold scholarships due to 1st class results in exams. Rowing will improve both your fitness and strength greatly. It is unique in comparison to most sports in that it exercises all of your major muscle groups. In addition, competitive rowing is a low-impact sport. When executed properly, the rowing stroke is a fairly safe motion, providing little room for the serious injury often found in contact and high-impact sports. It is good for you. Rowing develops important skills and qualities – rowing is a team sport so you will develop team spirit and team working skills, and also drive, determination, just the right amount of competitiveness, the desire to win and the ability to deal with, and learn from, losing. SCBC is run by a committee. Get involved to further develop responsibility and decision-making skills. Competing in the annual inter-College events as well as travelling to national head races and regional regattas is great fun. Within weeks of starting to row you will compete at the Queens Ergs Competition, the Clare Novice Regatta, and the highlight of the Michaelmas term, the prestigious Fairbairns Cup. Follow generations of Selwynites (such as Hugh Laurie) in their glorious struggle against other Colleges. Chances are you end up competing in major international events like the Head of the River Race in London and the Henley Royal Regatta. Forget every kind of racing you may have seen before, the bumps are the real reason for rowing while in Cambridge, a uniquely Oxbridge experience that should not be missed. Ultimately though, it’s great fun and that’s why the Selwyn Boat Club is full of so many great people. Click here to get in touch with our Lower Boat Captains and find out more.